Here's a photo of the leak in the front of the engine. I noticed a leak prior to yesterday's DE and couldn't really see the source of the leak so I cleaned it up, topped off the power steering fluid and went out on the the track. I noticed fluid on the bottom plastic pan today and removed it. Lots more fluid coming from that same area. It is power steering fluid, but I can't see the source. Inspecting the fluid level, it is lower today than yesterday before the DE. I do have a UD pulley and the PS system is probably the original one on my 2002 Boxster S.
Did I cook a hose or seal? Or did it just puke some fluid? Should I just go ahead and replace both return and pressure hoses? How heard is it to R&R the PS pump an hoses? Could it be overflow? Heat, high revs, expansion? Yes that is what I am assuming for now. I cleaned it up, topped off the fluid and replaced the overflow/vent tube that dumps right onto the engine with a longer tube connected to a steel canister (fuel filter). I drilled a vent hole on top of the canister so that if it does get filled up (rather big canister), it will dump. Last edited by NewArt; 03-12-2017 at 06:10 PM. I had a long history of various PS leaks over time. (Lots of track days back then.) Since converting the car to a Spec Boxster, I have not. I suspect it is due to a combination of (a) the underdrive pulley making it work slightly less hard and reducing the heat, and (b) removal of the A/C compressor which has taken away the horrible combination of heat source sandwiched on top of the defenseless PS line (which is itself practically sitting on the hot engine block). 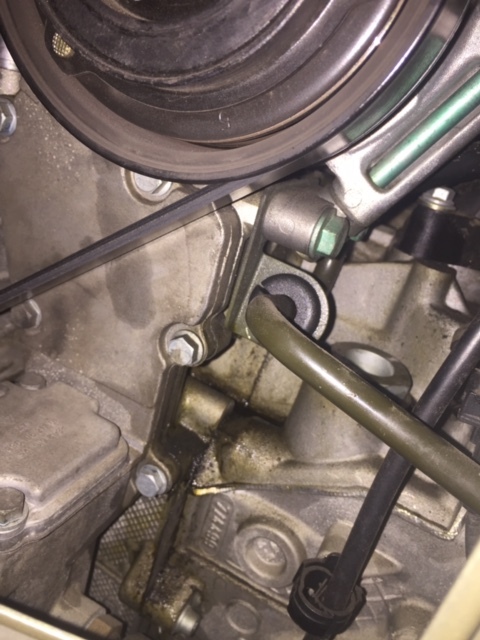 A very common kind of PS leak on tracked Boxsters is the melting of the plastic coupling near where the PS line snakes under A/C compressor. I think it's the coupling of a hard line going into the PS pump. So after the last CVR HPDE, I took the power steering pump and reservoirs apart and really still couldn't pinpoint the source of the leak, other than maybe a trickle in the front of the pump, and some fluid on the top of the engine. So I suspected the pump itself (shaft seal) and also the lower reservoir to pump seal. The red plastic return compression fitting looked just fine. The lines and fittings looked fine too. Soooo here I go. Started shopping online for the pump and both reservoirs (lower and upper). Took a chance with a rebuilt pump from ********************************AZ, since I had luck previously with a rebuilt alternator from them. When I unpacked the pump, it looked terrible. Still had the old reservoirs attached to it, and had been half painted with black spray paint. Then, I tried turning it and had to use a strap wrench to "unseize" it. Was turning ok after that... So I proceeded to assemble the pump and new reservoirs, then installed in the car. Buttoned everything up and added fluid and purged the air with a few lock to lock turns. That pump did not sound good. It was whining like it was bad. I disconnected the lines at the rack thinking there was trapped air, but still the same thing. Very loud whine and worse at higher RPM. Obviously this was a BAD pump, so I proceeded to unbutton everything and pull the pump out AGAIN! Guess what? It was much quicker the second time! Well, needless to say, I was not happy. I returned the pump and got a new LUK one. One thing to note: they wanted proof of "professional" installation to return the pump under warranty!!! After looking at the pump, they did not press this and gave me my money back (thanks ********************************Az). Installed the new pump, filled with fresh fluid, and works like a champ! No leak so far (and even better, sound normal now). Ready for Sunday's HPDE at Wild Horse Pass East track! woohoo! Not sure why it's getting blocked, but it was "Auto-haus-AZ". I've had good luck with stuff I've got from them. I kinda wonder if someone "returned" their junk piece and they sent it to you without looking at what was returned. Try RND Euro Parts = free shipping,no tax,great prices.